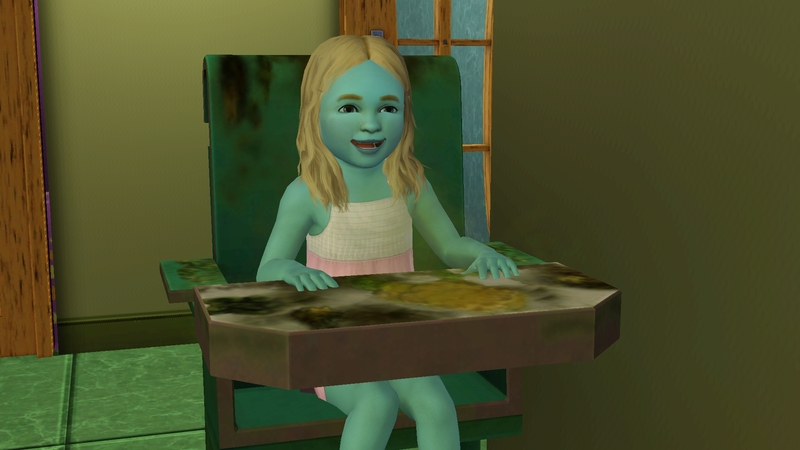 All three girls of generation two are toddlers, at the same time. The only thing good is there was just enough of a gap with them becoming toddlers that one was able to complete their toddler training before the next one needed to start. 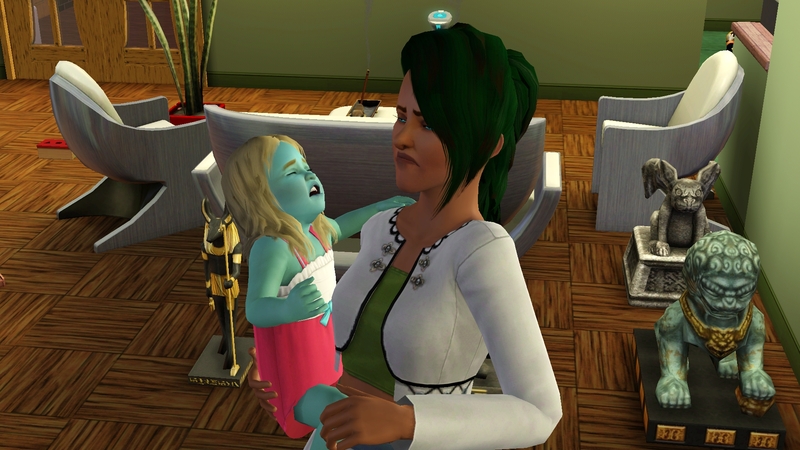 I have been slowly trying to get all of the family into the sim and family bin. It has been a learning process because while I do know how to do it, I have never tried to share so many with different occults. I have been saving each sim individually in CAS, then creating a new version, adding their spouse or partner as appropriate, then placing them in my family bin. This will allow future immigrants to be created using their DNA. I love NRaas Story Progression. I am then sharing the household from the family bin. For the most part, as a few may be shared from the sim bin. Just let me know if you would like to download a different version and I will see what I can do. 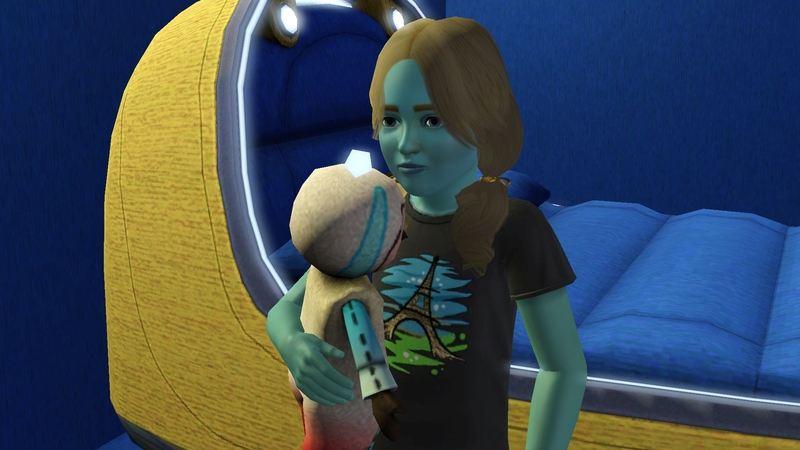 For the imaginary friend challenge, apparently Rachel did not receive a special doll. She is not impressed with this turn of events. Although I really do expect Primrose to win the heiress poll due to her pink hair. Molly is up to 6 grandchildren. Bill and Fleur are making sure to do their part; however, Molly wishes to have 10 grandchildren so they are going to need to continue making babies as Oskar and Emilie are done. Hold the presses! Rachel’s special doll finally showed up. It must have been delayed in the mail. 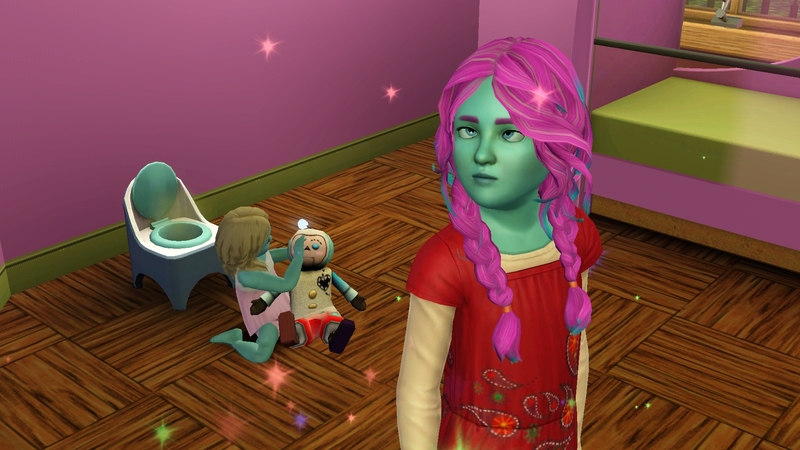 Well, this feels like the toddler spam chapter. The birthdays need to begin soon. Because of the time of day when each was born, there are 3 days between Leia and Prim and 2 days between Prim and Rachel, so once they start they will be back to back. Once everyone is a teen, they will make their special dolls into imaginary friends and then into real boys. In the meantime, Emilie is painting and painting and painting, Oskar is listening to handiness podcasts and working out, and Molly gets to clean the house and keep up with the girls. Grandmother of the Year award without a doubt. Missy, having moved out on her own, has decided to settle down and marry Rafael Wisteria. Rafael was apparently dumbfounded that anyone would think of marrying him. Missy doesn’t show up in the family tree as she never actually married into the family, and Odo’s ghost has not been around recently. If I can capture him, I will put him and Missy up for download as a couple, because they belong together! 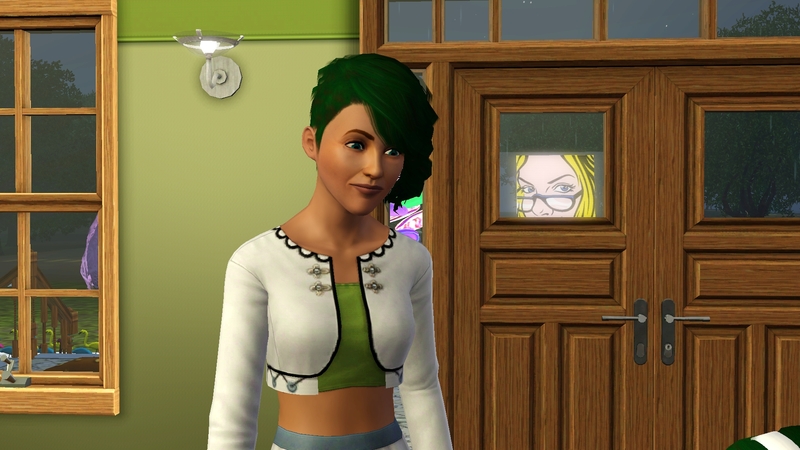 I sent Molly out to mourn for him and his ghost decided to come haunting almost immediately. Alright, I admit, not including Bill in the heir poll was a mistake. He has had three boys, three colorful rainbow boys. I finally deleted the high chair since the girls were frequently stuck in there for hours, and Oskar had a tendency to stuff them with multiple servings of baby food. 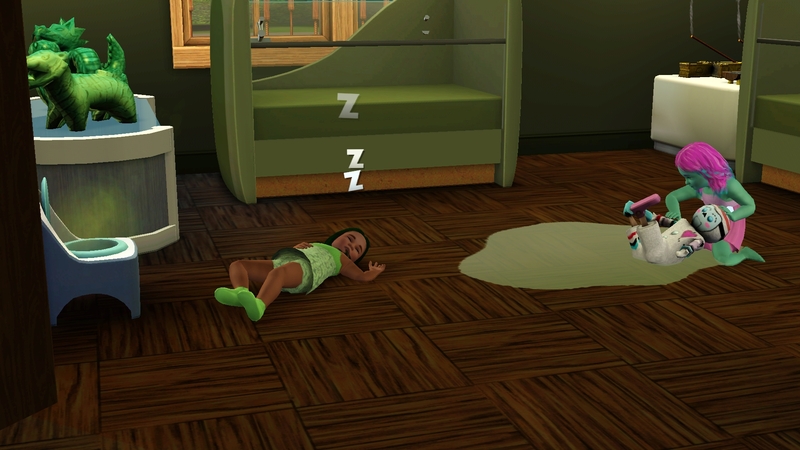 With no service sims allowed, at least they didn’t caught in the loop with the babysitter puts them in, takes them out, in and out, in and out, without ever serving them anything to eat. Leia declares her love for horses, which she won’t be getting while living in this challenge. 5 days until they are all children, 12 days until they are all teens. In a fight between a zombie and a ghost, who would win? 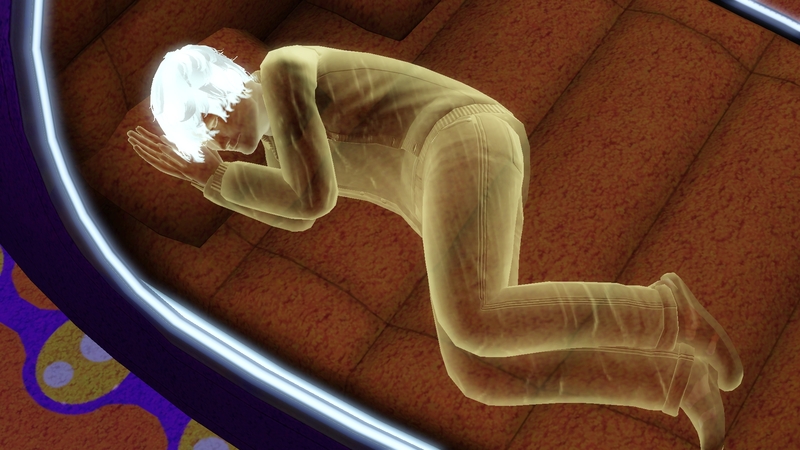 For the download of Odo, his traits are Adventurous, Friendly, Clumsy, Night Owl, and Supernatural Fan. His lifetime wish is Great Explorer. I went ahead and set him up to download without Missy but Missy will be available in a separate package. At the same time, I added Oskar & Emilie to the list. They will download as a couple. Emilie reached the pinnacle of the painting career and decided to take some time off. 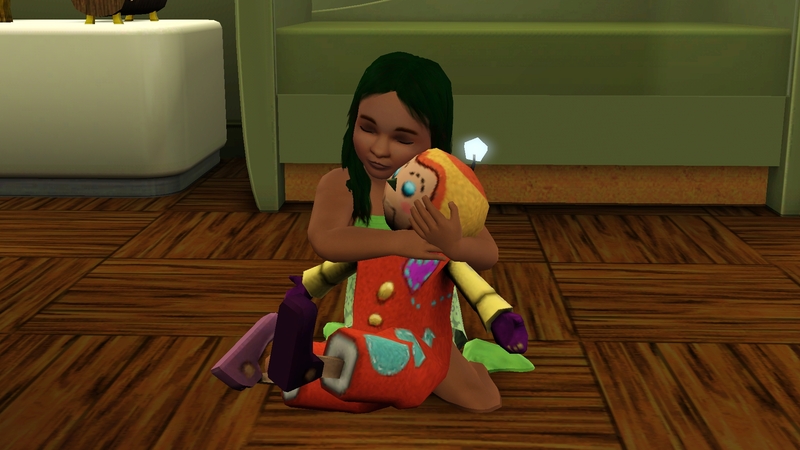 She started playing around with one of the jetpacks that Wade brought home. 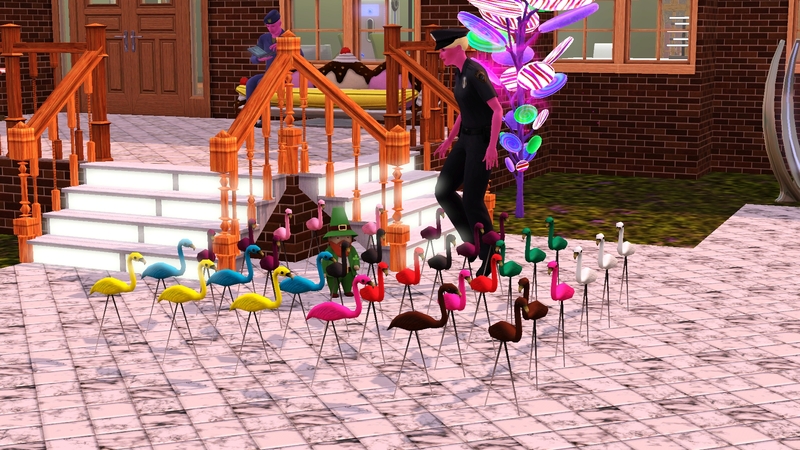 The flamingo army is flourishing and working on taking over the front walk. In addition to the foreign gnomes that Molly brought home, the family as acquired a Mr Mysterious and a s-GNOME-man. While Mr Mysterious has kicked the bucket already, the others are doing fine and living well. This chapter will end with the girls all children. There will be one more chapter to get everyone up to the heiress poll. About this point, I realized (and I realize that I say that a lot), but I realized Emilie wasn’t aging. As Oskar’s imaginary friend she should be the same age. But along the way, she apparently stopped aging three weeks ago. 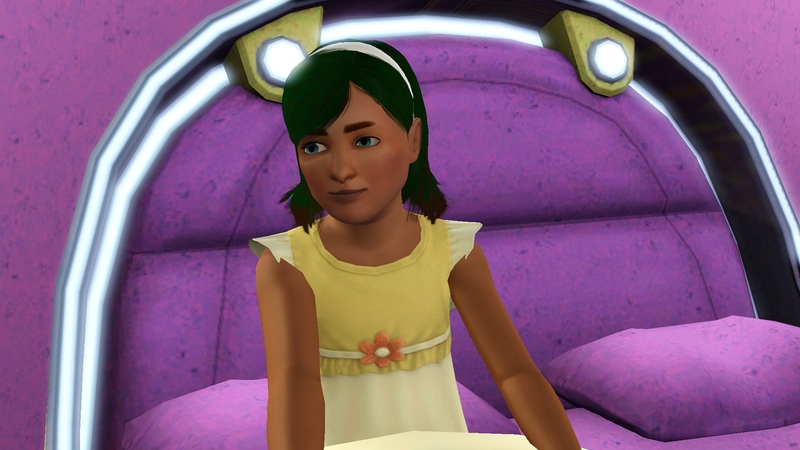 With the glitch, and it was a glitch as she couldn’t use the birthday cake or the Age of Instant, I was forced into using shift+click Trigger Age Transition. After becoming a “full grown adult” she decided it was time for a new hair style. Something a little more grown up. So she said. Finally, the youngest grows up a little. 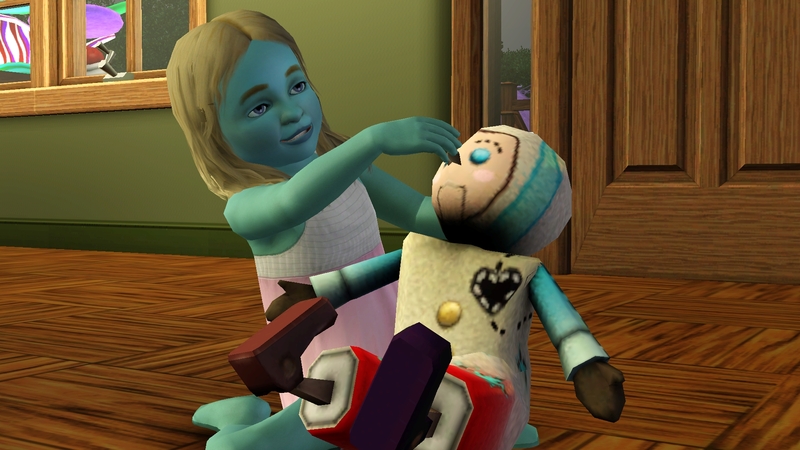 Rachel adds Good to her traits and heads directly to claim her bed and play with her special doll who promptly becomes her imaginary friend.